Whether you put too much food down the garbage disposal (we prefer composting), too many leaves fall into the gutters or grandma's famous tuna casserole left your oven covered in an unknown greasy substance, things stop performing at their optimal level unless they're cleaned. The same is true for your car's engine. Residue gets left behind in your engine every time you turn off your car. Any time an engine shuts down, it goes through a 'hot soak'. A hot soak is when your engine is still producing heat and there is no air flowing through it to cool it down. During the 'hot soak' period, fuel residues become thin deposits called gum and varnish. with time, these this residues accumulate and bake into rock-hard carbon deposits, which can be very difficult to remove. The hard carbon deposits cause a multitude of problems with engines. these include hard starts, stumbling, loss of fuel economy, increased emissions and reduced performance. To unclog your gutters, all you need to do is remove the leaves, use some oven cleaner to remove the mystery grease from your oven. But how to clean the deposits from your engine? Regular fuel system cleaning as a preventive maintenance can address the fuel deposit-related problems before they require expensive repairs, including engine dis-assembly and part replacements. 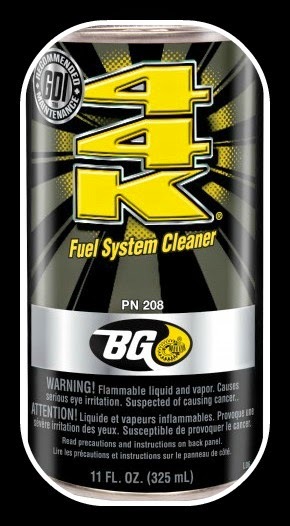 Our favorite product is BG 44K Fuel System Cleaner. We recommend using it annually (12,000-15,000 miles). It is a standard part of our maintenance services for our customers. This is poured into your fuel tank (good to have a full tank)and as your car runs, the product will clean throughout, helping to remove those harsh deposits and improving vehicle performance.